If you’ve ever woken up on the shoulder of your neighbor after a long plane ride, you know how hard it is to get some rest on the go. 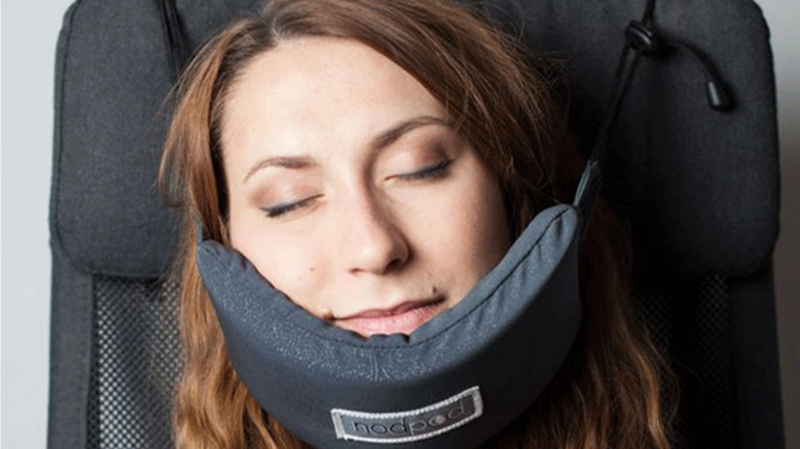 A new product, spotted by Metro, offers a solution for travelers who don’t mind looking a bit silly: a "head hammock" that cradles your chin as you drift to sleep. The NodPod, currently seeking funding on Kickstarter, claims to provide a more comfortable, upright snooze by holding your head at a 90 degree angle. The cushioned sling attaches to your headrest (without blocking the screen of the person sitting behind you) and can be adjusted to keep your noggin snug in place. The product’s crowdfunding campaign has already raised over $141,000, exceeding their initial goal of $20,000. Donors have until September 9 to pledge $32 or more to reserve a NodPod of their own with shipping estimated for November of this year.